Previously denied to US new car buyers, the Audi RS3 is now available in North America exclusively as a sedan. A mighty 400-horsepower is produced by the 2.5-liter five-cylinder gasoline engine, with that impressive grunt being transmitted to all four wheels via a seven-speed automatic transmission. Rivals do offer that bit more outright dynamic engagement, but the Audi RS3 is still entertaining to drive, with the engine in particular defining the car’s character. Plus, being based on the standard Audi A3, the Audi RS3 has plenty of attributes that make it a great car to use on a day-to-day basis. Many a potent compact performance car is on the market now, and the Audi RS3 is by some margin the most powerful of them all. It’s not just in engine outputs, however, where the Audi RS3 impresses: entertaining handling traits, benign user-friendly manners and the build quality and practicality attributes of the standard Audi A3 sedan all make this range-topping performance variant a rather well-rounded car. Only the limited trunk space and ever-so-slight dynamic deficiency to some rivals dampen an otherwise impressive vehicle. The standard Audi A3 sedan already has one of the most pleasant interiors in this class, and the Audi RS3’s is even more so. Complementing the high-grade plastics and leathers are trim pieces shod in appropriately sporty materials such as Alcantara, and the sports seats offer loads of support. Interior space in the passenger cabin satisfies too, with lots of head and leg room in the front and back seats – though it’s worth mentioning shoulder room in the rear row is a bit limited. Likewise, trunk space is rather meagre by segment standards at just 10 cubic feet, but the trunk opening is at least broad and low enough to make loading more cumbersome items in fairly straightforward by sedan standards. Some key rivals are more engaging to drive. That slightly softer edge does aid day-to-day usability, though. If you crave the utmost dynamism from your compact performance sedan, the Audi RS3 may end up disappointing. Though considerably more engaging to drive quickly than its predecessor, the Audi still lacks the precision of more driver-focused competitors. Still, the Audi RS3 is an enjoyable car to control, as a result of its excellent all-weather traction levels, strong brakes and direct input responses. Ride quality’s also pretty good for a performance car, though the firm setup can result in some jittering and fidgeting over rougher roads. Visibility is satisfactory, as are low speed manoeuvrability – though it’s the impressive noise insulation levels that make the Audi RS3 a relaxing vehicle to spend time in on longer journeys. Being a five-cylinder engine already makes it stand out from the crowd, but the Audi RS3’s 2.5-liter gasoline motor has more going for it than that. With outputs of 400-horsepower, it’s by some margin the most powerful engine in this segment, and the equally impressive torque figures mean there’s plenty of pulling force across a majority of the rev range. On top of being a smooth-revving engine as well, the 2.5-liter also produces a unique, bassy warble from the exhaust that adds to the car’s character. All that power is sent to all four wheels via a seven-speed automatic transmission that changes gears smoothly and succinctly – regardless of whether you leave it in automatic or change gears manually using the paddles on the steering wheel. Fuel economy is understandably low at 19mpg city/28mpg highway, though the figures are reasonably considering the potency of the engine. 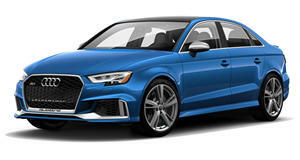 Audi only offers one spec level for the Audi RS3, so buyers who don’t want to fork out anything else over the base MSRP will be satisfied with the standard kit list. Adaptive suspension, all-round parking sensors, heated leather front seats and dual-zone climate control come with every Audi RS3. The only option we reckon is worth selecting is the $3,200 Technology Pack, which adds a Bang and Olufsen stereo, upgraded navigation capabilities and a super-swish digital binnacle display to the spec list. Buyers who are track day enthusiasts will also like the fixed sports suspension and front carbon ceramic disc brakes on the $4,800 Dynamic plus Package. 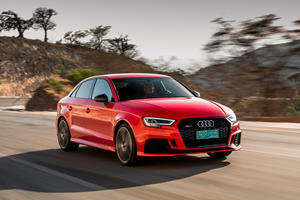 No crash test details on the Audi RS3 are available, though the strong performance of the Audi A3 sedan should ensure this performance range-topper will offer as much protection. Though some competitors are that bit more engaging to drive, the Audi RS3 is still terrific fun to steer. Factor in the stellar engine and impressive user-friendliness, and the Audi RS3 sedan becomes a rather encouraging ownership prospect. Even when running winter tires. 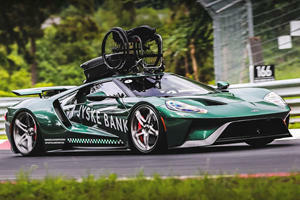 A half-mile record, one-of-a-kind Ford GT, and some crazy wagons.